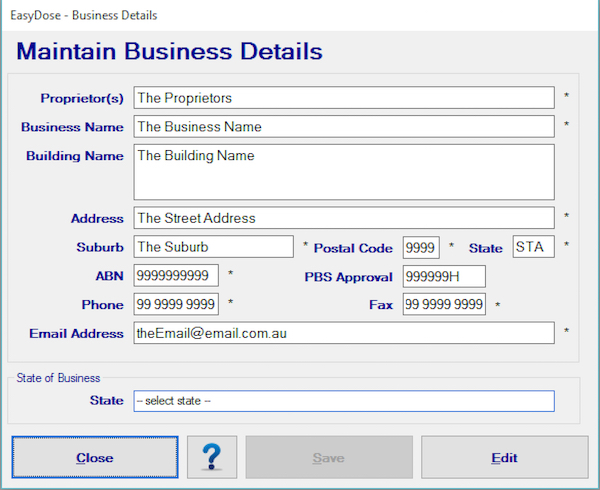 The Business Details Form is an integral part of EasyDose and MUST be completed in its entirety, except for the Building Name. All fields with (*) require an entry as each field is referenced by the program during many stages of its operation. Many other forms and reports utilise this information such as the Email Address, pharmacy name and Address on reports and more. A state must be selected which will set the system defaults applicable to that state. The form is straight forward and has various input masks to ensure accuracy of entry.